For a challenge, check out the Eta Aquarid meteor shower through Friday, 5/10. For an easier challenge, there are planets aplenty overhead. 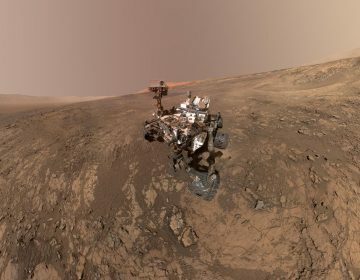 Plus, Richard Branson’s successful SpaceShip One Test last week puts the project on pace to offer passengers an out-of-this-world experience by this time next year. [Dave Heller] A new moon this week means a nice, dark sky for stargazers. Let’s head out of doors with Derrick Pitts, chief astronomer at the Franklin Institute. Derrick, when is that new moon brand new? [Derrick Pitts] The new moon’s brand new on Thursday this week; that’s sort of late in the week for the Eta Aquarid meteor shower though. But that at least gives us a little dark sky between now and then. So when is the Eta Aquarid meteor shower? The Eta Aquarid meteor shower actually begins in late April and runs into early May. The peak of the shower though happens to be over this past weekend, particularly last night, tonight and into tomorrow morning, most notably around the hours before sunrise, a couple of hours before sunrise. That’s when the radiant point of the shower rises above the horizon. We will see members of the shower throughout the night, but there’s a question of how many we actually will see. The typical background rate is about 10 per hour, the peak for this shower may run as high as 55, so we’ll have to see what the Eta Aquarids will show this year. And best case scenario, if it hits 50 or 55, contrast that with the better known showers throughout the year. It’s about half the rate of the better known showers of the year, maybe a little bit less than half of the better known showers, but it’s actually interesting that in the springtime the Eta Aquarid shower hasn’t always been known as a shower worth watching. But as it turns out, we’re seeing a bit of a better rate of the Eta Aquarids this time around than we have in the past, given that the sky conditions will help us out as well. And with those favorable sky conditions, there must be plenty of planets to be seen. As it turns out, the evening sky is just peachy for looking at planets this time of this year. We have Jupiter over on the western horizon just as soon as the sky gets dark. We can see that without too much difficulty; it’s about a third to half the way up the sky as the sky gets dark. And then over on the eastern side of the sky we have the ringed planet Saturn making its way above the horizon about an hour later, and it is up and visible all night long. Both look really great in a small telescope. And as nice as the weather has been over the last week or so, if it holds good for the next week or so, if you have a small telescope in a closet someplace it’s a great time to pull it out to see what can be seen. These two planets are very easy targets. And we’re getting ever closer to the time when night sky aficionados will be able to take it in from outer space. And wouldn’t that be a great sight to see? Especially if you’re on a spacecraft yourself as an astronaut floating in zero gravity or near zero gravity. 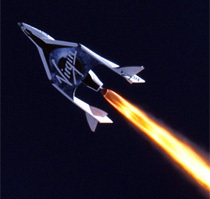 Of course what we’re speaking of is the fact that just last week Richard Branson’s Virgin Galactic spacecraft successfully passed one of its first flight tests, firing its rocket engine for sixteen seconds. That was the opening test to prove that the engine and the spacecraft would work well together. That was a very successful flight. 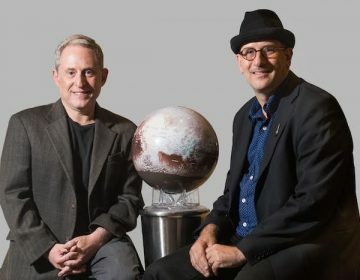 There will be a number of additional test flights that run through the summer up through the fall, and by this time next year, the first passengers should have already been to space as what we might call space tourists. How much is coach fare? Well coach fare up until now has been about $200,000 per ticket. But since the program began eight years ago, Branson and associates are beginning to think that due to inflation, the price might have to rise for a little while to compensate for that change in the monetary value since then. So the ticket price has gone up to $250,000. But that comes with a snack and a soda? I’m not sure it comes with a snack, but it certainly does come with a soda. Peanuts, at least, I think you’ll get. Now is this experience initially an around-and-around, or just an up-and-down? You know, this is very much like the very first flight taken by Alan Shepard. In fact, we’re honoring Alan Shepard’s first flight today, in 1961, in which he took that first American flight which was just what you call a “ballistic flight” — that’s up, over and down. A very short flight his was; I think his was no longer than about twenty minutes. This flight will be a bit longer than that, but it will still be the same profile: Launch, takeoff, go up, loop over and come back down. No orbits. I’m starting to save my money right now. I’m sure if those pennies pile up, you’ll eventually get there. 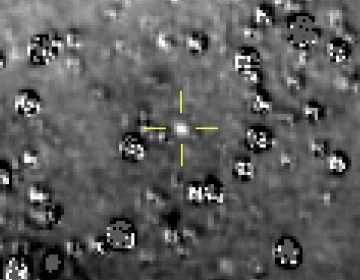 NASA's New Horizons spacecraft has survived the most distant exploration of another world, a tiny, icy object 4 billion miles away that looks to be shaped like a peanut.